Millers stars Dale Tonge, Lionel Ainsworth and Andy Warrington spoke to young people from local high schools about how to tackle racism with Show Racism the Red Card at a special event on Thursday 25th October. 60 students from Winterhill High School, Clifton High School and Wales High School attended Rotherham United's New York Stadium for a full day of educational activities - plus a tour of the brand new stadium! As the finale to event, the young people had the chance to pose questions to the panel of current players, ex-professional Olivier Bernard and Deputy Leader of Rotherham Council, Cllr Jahangir Akhtar. Chief executive of SRtRC Ged Grebby said: “We are delighted to be working in partnership with Rotherham United and the Community Trust. “The young people had a fantastic day at the new stadium and benefitted from the opportunity to discuss and explore issues of racism. They left with a greater understanding of the subject and critical thinking skills to reject stereotyped and prejudical attitudes. Read more about this event on Rotherham United's website. 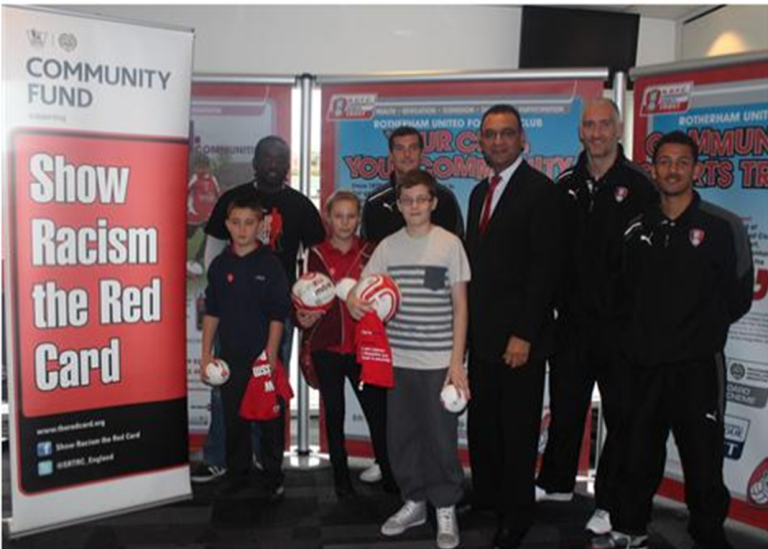 Show Racism the Red Card would like to thank Mark Cummins and all at Rotherham United Community Sports Trust for their ongoing support.